After watching and enjoying Toradora so much, I decided to fire up my DVD collection and go on a Great Teacher Onizuka (GTO) marathon. After reaching episode 13 in one day I had to put my aching tummy and tear stained eyes to rest. I couldn't stop laughing after watching it. 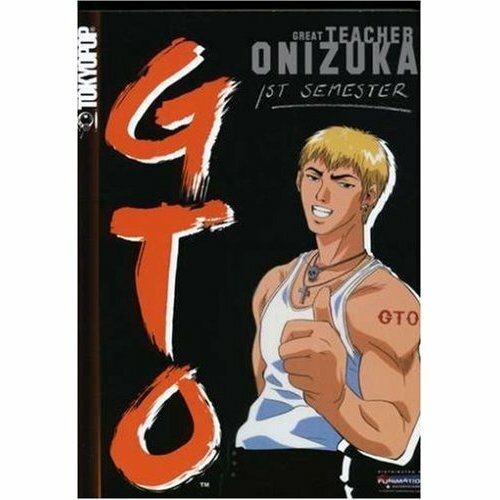 GTO tells the story of Eikichi Onizuka, a 22 year old ex motorcycle gang leader who endeavors to enter the world of highschool teaching. Initially he wanted to enter this vocation because of all the young and easily impressionable girls that could be had, but he found out that he's not one to take advantage of the innocent. After passing his OJT at a local highschool he misses the national exam for teachers making him ineligible to teach at a public highschool. His friend Ryuuji however does him a favor by telling him that he can still work at a private highschool even without a certification. At the Private highschool he initially befriends a fellow applicant in Azusa Fuyutsuki who will serve as his love interest later on. He also makes enemies with the Vice Principal on the way to school causing his initial rejection. Thanks to the Director however he is given a second chance and a job. Unknown to Onizuka however is that she has ulterior motives in taking him on as a teacher. And that is because she thinks that he is the only who can handle Class 3-4. A class of 14 year old delinquents that have caused a lot of teachers to quit and go into nervous breakdowns. And that is where the fun and the series develops. As Onizuka tries to win them over, solve their problems and give them a fun middle school experience. Armed only with his "shoot first ask questions later" attitude that seem to fix everything in the end. We also get to see on the latter part of the anime why the class turned out the way they did. GTO initially started out as a manga by Tohru Fujisawa that then got made into an 43 episode anime series and a live action tv drama due to its popularity. You definitely won't be disappointed if you watch it.